Rawhide Western Town & Event Center is the perfect place to host a private event whether you are a group of 40 or a group of 4,000. The town of Rawhide promises to deliver up a true western experience with our multiple western attractions, retail stores and games throughout town. Let us blow your expectations away with the shows put on by The Arizona Roughriders in the Six Gun Theater. Take a ride back in time on our Butterfield Stagecoach or the Huntington Express Train to get a real feel of good ol’ western transportation. The Widow Maker, our mechanical bull, promises to offer your guests a ride, but hopefully not a brief one. And please don’t forget to visit our special friends in the Petting Zoo; goats, horses, pigs, ducks and many more of our critters are waiting there to make you smile. For the shopaholic, we have our General Store offering the perfect western mementos from t-shirts to BBQ sauces to picture frames and more. Sweet Sally’s candy store serves up 20+ different flavors of homemade fudge, plus old fashion and current delicious candy. Travel back into the 1880’s with us just for one night! Rawhide is your personal western playground and we can make everyone feel like they are from the Wild Wild West. We offer additional entertainment from a Quick Draw Competitions to whole private Western Casinos to help enhance your total experience. 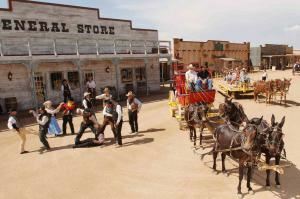 We look forward to welcoming you to our 1880's western town full of fun, good eatin', great shopping, and a true taste of the old west you'll not find anywhere else in Arizona! The Koli Equestrian Center located at Wild Horse Pass offers miles of breathtaking scenery and horseback riding trails. With plenty of room to accommodate 500 guests, Koli is a popular venue for groups that wish to experience Arizona. Koli is the perfect site for horseback riding, jeep/Hummer tours, cattle drives and cookouts. Maricopa Wells, an authentic stage stop located at Wild Horse Pass on the Gila River Indian Community offers dramatic backdrops of western history. Guests will enjoy a rustic Saloon and quaint cowboy town filled with cowboy games and western fun. If a more cozy setting is what you’re seeking, look no further than The Moonshine Room. Offering a unique, rustic look, this indoor venue is perfect for smaller groups of 50-150 guests. Bring authentic western flare to your occasion. Rawhide's Desert Cookout Site welcomes 50-1,000 of your guests to celebrate under the stars. Mesquite-grilled steaks, barbecue baby back pork ribs and barbecue chicken complete with all the fixins are served to live country music and dancing every night. Brave diners will love the house specialties the Rawhide Rattler and Rocky Mountain Oyster appetizers. Both are battered, fried and served with cool ranch dressing. Try one of these delicacies and receive an official Rawhide commemorative certificate of bravery. You won’t want to miss the apple pie and cinnamon swirl ice cream, our legendary dessert. Our Rodeo Arena is one of the largest performing arenas in Arizona. Seating 6,500 people, the Main arena measures 350' x 150' and we offer two practice arenas as well. Your guests can enjoy the thrill of Bull Riding, Bronco Riding, and all the excitement of a rodeo held privately for them. Connected to the world-famous Rawhide Steakhouse, the Sunset Room can accommodate 50-250 of your closest friends and family members. Located in the heart of Rawhide's Main Street, this Spanish-style patio and is sure to bring a taste of Old West charm to your special day. The open-air setting and adjoining climate-controlled cantina provides a relaxed atmosphere for up to 300 people. Offering 52,000 square feet- the ideal location for trade shows, gala dinners, and award presentations. The Pavilion can accommodate 6,000 guests theater style or 4,000 banquet style. The Pavilion offers western facades to create intimacy for any party regardless of size.